There are certain things I’m willing to spend money on because they’re worth the investment and are hard to find other places. But when I saw the popularity of thick Sade-inspired round gold hoops coming back into style, I knew immediately I wasn’t willing to shell out hundreds of dollars to get the look. Granted, you can probably get thin faux gold hoops from your local Claire’s, and finding thick one to two inch hoops is harder, but it’s not impossible. 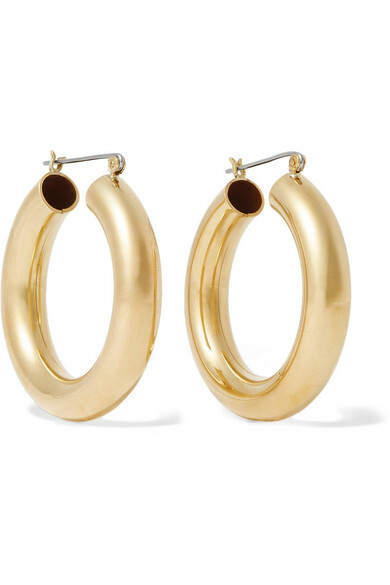 The most expensive and celebrity favorite version like Sade’s hoops are from Jennifer Fisher— they’re gold-plated so not even real gold, and they’re $550. And while they are beautiful, $550 is steep for fake gold earrings. So when I found these Laura Lombardi hoops, I was instantly sold. They’re perfectly sculpted and round, each pair hand-crafted out of a gold-tone brass instead of a gold-plated gold so it has the same shiny look but for less than half of the cost. And my favorite feature? They’re hollowed out in the center so even the most sensitive of earlobes can wear them since they’re light as a feather. Every single time I wear my pair of Laura Lombardi hoops, editors ask me if they’re Jennifer Fisher and it brings me so much joy that I only paid $100 for them.